It’s a bright sunny day, when I snap this photo. I’m even more optimistic when I think of a month’s reading, when the sun shines. More hours with good reading light. And, in February. What could be better. You can see the sheen of it in the image, the veil of sun in the room with this stack. But, even so, the stack begins with Winter’s Tale by Mark Helprin. This is one I have begun before. My marker was still in place. It is still there, now, but, since, I have reread those 200 pages. This is the juncture between the first and second parts of the novel (there are four in total). And I think I stopped for two reasons. It was more than ten years ago, so much of this is guesswork. But the first reason is easy: I did not love it. And the second, I can guess, for it seems that all the characters I had come to know in Part One have moved along, to make room for new characters. Now, however, it is the right time for me and this story, so I will read on. Because this time I do love it. Some of the sentences are slippery, but many of them are beautiful all the same. And I’m not sure whether it’s fair to have readers’ hearts so enthangled with a group of characters who seem to disappear after 200 pages spent in their company, but there are some unforgettable imaginings, and a deep love for New York City and the surroudning river systems, which is positively contagious. Of the books which begin my February, this is the one which most excites me in the evenings. Which in your current stack is calling to you most loudly? 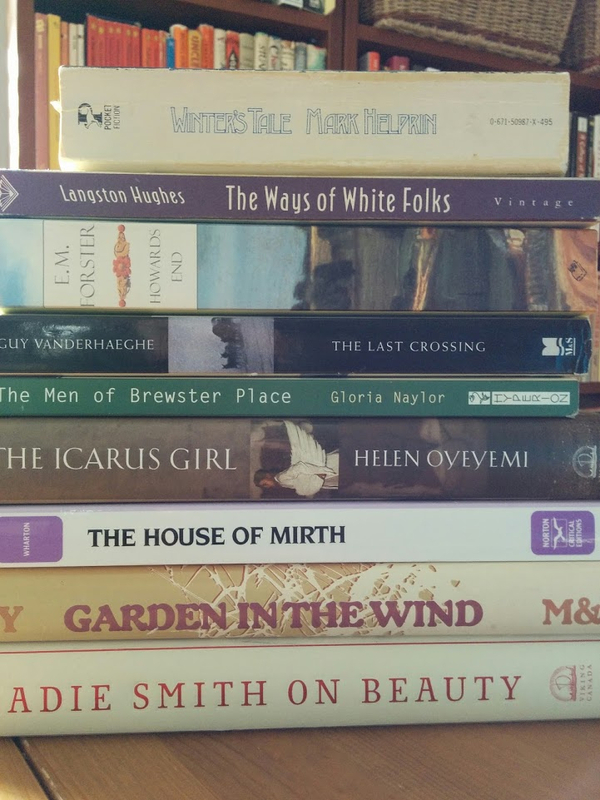 There are two other volumes in this stack in which I’ve read a substantial number of pages as well: Langston Hughes’ The Ways of White Folks and Gloria Naylor’s The Men of Brewster Street (a third and two-thirds of the books respectively), two collections of stories. 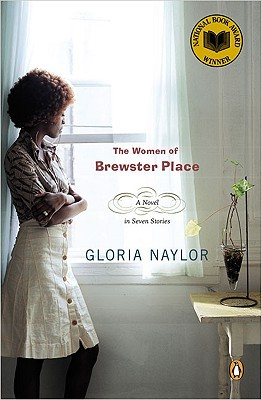 Gloria Naylor’s The Men of Brewster Place revives a character from her The Women of Brewster Place, and his observations serve to unify the stories. He plays the role that the buildings themselves played in the earlier collection, drawing together disparate characters, who all found themselves unhappily relocated there. Having read The Women of Brewster Place two weeks ago, I am keen to uncover the stories of men who made only brief appearances in those earlier stories. In many cases, particularly Basil’s story, for instance, his perspective fills a gap which adds so much to Mattie’s story (in the first volume) that I had to go back and reread. The prose is clean and polished, but the main draw for me, with this collection, is the story (broad and narrow). With Langston Hughes’ collection, the stories are powerful, but the main draw for me is the use of language, the relentless rhythm of his prose. The Ways of White Folks has the kind of sentences that make you want to read aloud. The vocabularly is unremarkable, so this comes down to phrasing and shaping. The stories range in length from fewer than ten pages to thirty pages, but each captures an experience succinctly and memorably, then makes it indellible by polishing its shell. One book in my stack is actually complete, Edith Wharton’s The House of Mirth. I’ve lost track of the number of times that I have tried to read this novel, but I can think of three times in the past five years, never making it beyond the first reading session (about the fourth chapter). This year, I understood something that I had not understood before, and I knew it from the start. Edith Wharton does not write happy stories. She is not Jane Austen in another century’s clothing. She does not follow the conventional formula of marrying off her heroines into contentment at the end of her books. Actually, there is heartbreak in each of these volumes (even Winter’s Tale, which I wholeheartedly forgive), but I know what Edith Wharton is about now, and I will read on with her too. First, however, I have some excerpts to read at the end of this novel, before I can move on to another Wharton. Do you have a favourite of hers? 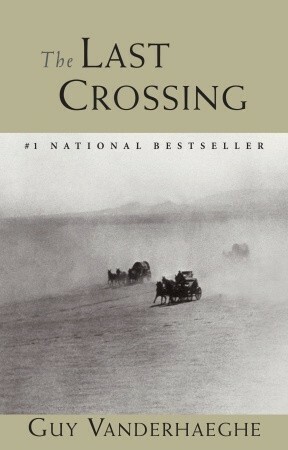 On one hand, you would not think The Last Crossing is authored by an academic, for while one does not necessarily find beauty at the sentence-level (but, sometimes, that too) there is a sense of beauty across the work as a whole. Which means that someone has taken great care with every single sentence, even if not dressing it in its Sunday best. It moves at its own deliberate and measured pace and each word feels as though it belongs exactly where it sits. On the other hand, the amount of research behind these stories (the early Hollywood years in The Englishman’s Boy, for instance) is remarkable, and one can discern it in the detail. Not in terms of world-building, which Guy Vanderhaeghe does with a subtle touch (he’s not about proving how many facts he knows, he’s all about allowing a natural credibility to take root). But in specifics, like word selection. If one could use ten words to describe something, this writer chooses the single one which best suits his character. And chances are, that that single word, is actually not one of the ten which you might identify as options, but one of twenty, and many of those you do not even faintly recognize. As with The Englishman’s Boy, The Last Crossing relies on multiple perspectives, and I am looking forward to inhabiting their points-of-view in the weeks to come. Howard’s End and On Beauty, the perfect pair. E.M. Forster is one of my MRE authors. Zadie Smith’s novel is one I have begun on many previous occasions as well (a la Edith Wharton). This is my last of his novels to read freshly. Smith’s essays are among my favourites, and I loved all of White Teeth fervently, with the exception of final two pages; I hope On Beauty works for me this time. Gardens in the Wind by Gabrielle Roy. One of a handful of her books to read this year, most of those remaining being non-fiction, but this one is a collection of stories. Because I really enjoyed the last collection, Enchanted Summer, I am looking forward to this one too. The Icarus Girl by Helen Oyeyemi. The past year’s Giller Prize longlist, which Helen Oyeyemi played a role in assembling, as a juror, was particularly interesting, and I’m keen to try more of her fiction (the only novel I’ve read so far is Boy, Snow, Bird). And how about you? Any of these in your reading logs? In your TBR? What about your reading this month is making your reader’s heart beat more quickly? She’s someone I want to know better! Providing you don’t have some pie-in-the-sky idea about what she writes (as I did! ), I think that my starting point, Ethan Frome, would be a good one; it’s very short and, now that I think about it, consistent thematically. That is, if your not-remembering puts you in the position of re-beginning! I was eyeing ‘On Beauty’ for the Literary Wives group, so I’ll be interested to hear about that one, too! I haven’t read any Zadie Smith. Actually, I’ve gotten stuck in On Beauty twice before, so I’m a bit anxious about this one too. (This is the year I make good on books I’ve previously avoided!) Did you know it’s an homage to Howards End? If the LW group likes retellings, that might be a really good pick. Are you planning to read the Charlotte Gray bio after that? I started RIitB later last year but then discovered my copy was abridged so it went back on the shelf (and has yet to be replaced by the proper copy). Though I’m not really sure it should matter. A little less roughing it would probably still be fine, right? That makes me wonder what parts they decided to leave out of the original version of RIitB. I think it’s good, and that you would want to read the whole thing!